Around an hour and a half from Lisbon, Evora is a popular destination for Portuguese and foreign visitors alike. The biggest draw is undoubtedly the food and wine: both Evora itself, and the wider Alentejo region in which it sits, are rightly renowned for the quality of the cuisine. There's more to this attractive city than just its mealtimes, however. The compact downtown area houses several architectural and cultural highlights, the most well-known of which is also the most macabre. 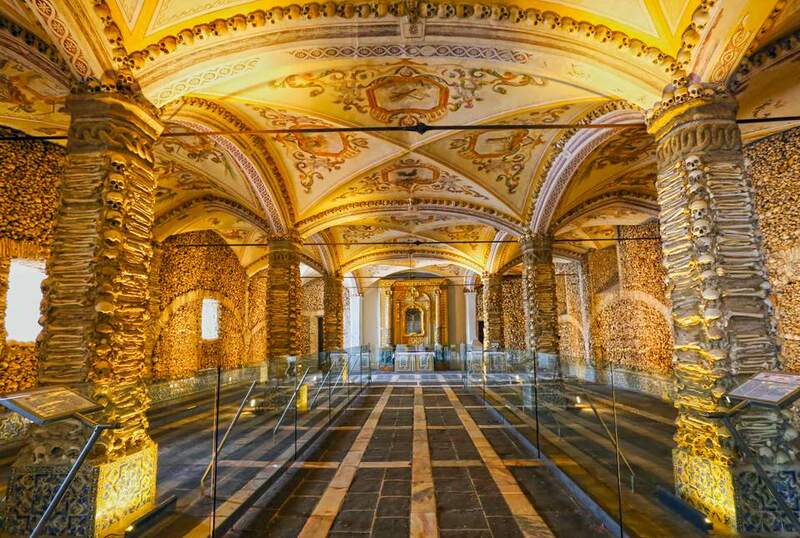 Capela dos Ossos translates literally as "The Chapel of Bones," and human bones are exactly what you'll find inside. Thousands of them, in fact, stacked high from floor to ceiling along every wall of this small chapel. It's a must-see for many visitors to Evora, so if you're planning to check it out yourself while you're in town, here's everything you need to know. The chapel dates back to the 16th century, when local church elders were faced with a dilemma. Nearby cemeteries were getting full and taking up valuable land close to the city, and something needed to be done. In the end, the decision was taken to close the cemeteries and relocate the bones of the deceased to a dedicated chapel. Never ones to forgo a teachable moment, the monks decided to place those bones on public display rather than hide them away. In this way, it was hoped, visitors would be forced to reflect on their own mortality, and modify their behavior accordingly while still alive. The success of this approach is lost to history, but the end result was the Capela dos Ossos we see today. Somewhere in excess of 5000 bones have been closely stacked on top of each other, taking up almost every possible inch of space. While most of the bones are separate, in a particularly gruesome twist, a pair of nearly-complete skeletons can be found hanging from the walls as well. In case the message wasn't quite clear enough for medieval visitors, the message "Nós ossos que aqui estamos, pelos vossos esperamos" ("we, the bones that are here, await yours") was inscribed above the entrance, and remains there even now. Evora's Chapel of Bones is attached to Igreja de São Francisco, a sparkling white church in the center of town. The entrance is clearly marked, to the right of the main church doors. The chapel and church are open every day except January 1, Easter Sunday, the afternoon of Christmas Eve, and Christmas Day. During summer (June 1 to September 1), the chapel opens at 9 a.m. and closes at 6:30 pm, while it shuts at 5:00 pm the rest of the year. Like many other attractions in Evora, the chapel also closes for lunch, between 1 p.m. and 2:30 p.m., so plan your visit accordingly. An adult ticket costs €4, with youth (under 25) and senior (over 65) tickets reduced slightly to €3. A family pass costs €10. The chapel is quite small, so don't expect to spend too long there. Unless you have a particular interest in old bones, 10-15 minutes will likely be enough. Depending on when you visit, you may end up spending longer in the ticket line than you do inside the chapel of bones itself! Once you're finished in the chapel, be sure to check out the church museum as well — access is included in your ticket price. What it lacks in human remains, it more than makes up for in religious paintings, sculptures, and other artworks from the convent's collection. Less than a ten-minute walk away, at the highest point in the area, lies Evora's cathedral. Tickets cost €2-4.50, depending on which parts you want to visit, with the highlight (at least on a sunny day) being the panoramic views over the city from the cathedral roof. Almost directly alongside sits the templo romano de Évora, the remains of a Roman temple dating back to around the first century AD. Destroyed by invading armies in the fifth century, it served various purposes over the millennia including, for many centuries, a butcher shop, before restoration and conservation work finally began in the 1870's. The ruins sit on a raised platform in a public square, and access is free.